Pros: Fast zipper closure. Inside national size limits for carry on luggage. Extremely lightweight. Durability. Cons: Soft sided luggage. Sometimes a bit too big for international size limits. Zipper is not that strong. We all like to go abroad after a long period of hard work. We deserve a period of destressing and your vacation can be wonderful or it can be a nightmare from the start. We want everything to go smoothly and this includes checking in at the airport with our luggage. 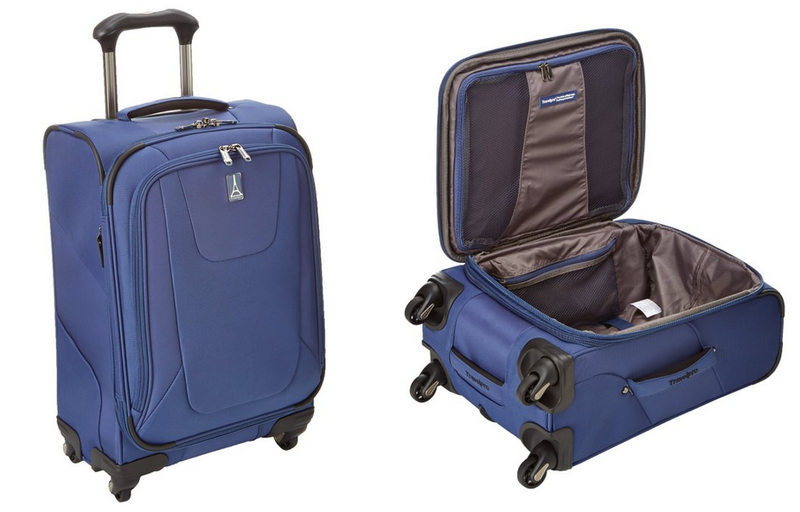 Travelpro Luggage Maxlite3 International Carry-On Spinner is a classic in the luggage market. With a Travelpro bag on your side you know you got a good bag on your hand. Travelpro was the first to invent the vertical suitcase with wheels and an extendable handle called a rollaboard. It’s a trusted brand that has loads of experience in making high quality luggage. The already specialize in this since the late 80’s. The Travelpro Luggage Maxlite3 is extremely lightweigth which makes it ideal as carry on bag. The maneuverability is perfect thanks to 4 wheels that can spin in all possible directions (360 degrees). And you got a telescopic handle that is easy to use and can be locked at 2 different positions so that it would suit anyone. It also has an extra handle if you would wish to carry it instead of pulling it around. The case itself is made from polyester and thus we have a softside luggage here. This means it’s a bit more vulnerable to damage. However this is the only drawback for this bag. It also has a honeycomb frame system which makes it strong from the inside. This will help to extend the lifetime of the bag. It has a fabric lined interior and a telescopic handle which can lock on 2 different heights so that it would be comfortable to roll around by people with different heights. Maybe one other disadvantage is that there is nothing special to the design. There are no special patterns available to choose from. The only colours to choose from are blue and black. To be honest the black version really looks good imho. It’s a very durable carry on luggage. The fact that is has corner guards and skid guards will only add to the lifetime of this luggage. Despite the fact that it is not a hardside luggage it has everything. Maybe the only other drawback is the design. Most people won’t care but travel enthusiasts with an interest in fashion might look further around. However it’s a solid bag to take with you on any domestic trip. They probably won’t have any issues with the dimensions of the bag. If you’re a frequent international traveler then it depends on the airline you fly with. The fact that it’s extremely lightweight is an added bonus for sure. If you look at all the positive reviews of the Travelpro Luggage Maxlite 3 then we can conclude that this is a must-have carry on bag!